I made a list of projects that I wanted to do...a list that keeps growing...and a pinboard of To Make projects, so I could remember the ones I wanted to do. I decided that since June is LGBT Pride month, my birth month, and this project is fairly basic, that I should do this one now, and make a little tutorial for it. I have a little obsession with Mexican fashions, food, and culture. It probably started when I was researching Dia de los Muertos for artwork inspiration. The clothing fits in nicely with my Gothic Bohemian style. To see the breakdown of how I styled this skirt yesterday, go to my OOTD. You will need some basic machine sewing knowledge. I don't recommend hand sewing it, as there is a lot of sewing involved to attach all the ribbon to the skirt. 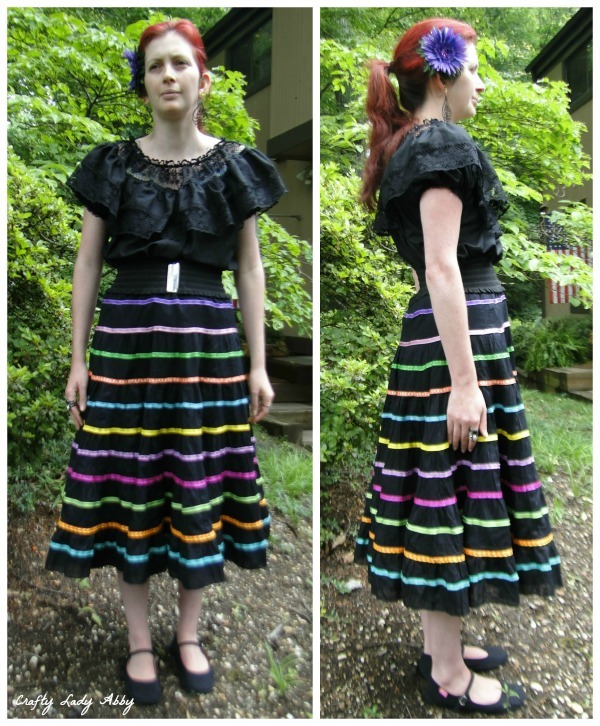 I used a pre-made tiered peasant skirt from Rugged Warehouse and embellished it with ribbon. You can use an existing skirt you own, buy an inexpensive one (mine was about $10), or make your own. Which ever way to choose to obtain your base skirt, just make sure it's black or white cotton. You will need many yards of ribbon. If you have a stash of 3/8" ribbon in a rainbow of colors, then the cost will be low for you. If you don't, you'll need to buy many spools of ribbon. You could do some fancy math to decide exactly how much you need. My skirt is tiered, which means the waist and hip area is a smaller circumference, and flares out larger to the hem. I used 11 different ribbons. You could use less, 6 kinds...one for each color. Plan ahead for yardage before you go shopping for ribbon. 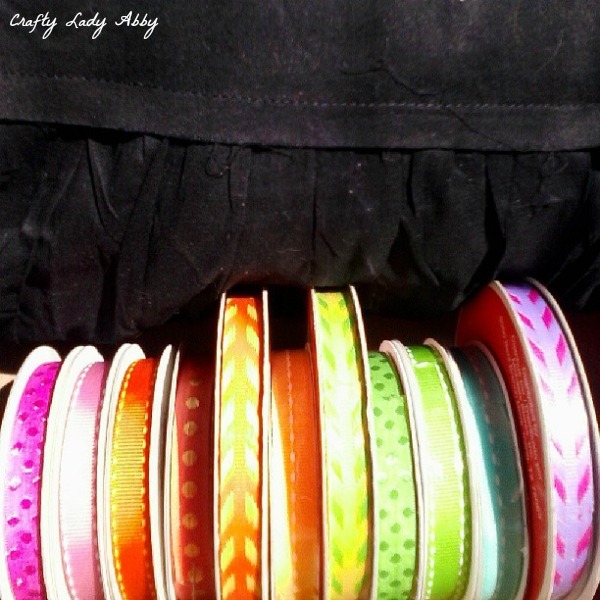 You might need multiple spools for certain ribbons, depending on how much ribbon is on each spool and the circumference of the skirt where you want to sew it. If you don't want to do a rainbow, then pick a few colors and repeat them. Or, use metallic or neutrals...silver on black, cream and tan on white. You can vary the width if you are using a smaller amount of colors...1 or 2. Wider ribbon will need stitching on both edges, vs just down the middle like the thinner ribbon. Since there is a lot of sewing, you will also need a lot of thread. I used black to match my skirt. If you use a white skirt, use white thread. Using the same color thread for each ribbon was the easiest for me. You could get fancier and hide your stitches by switching thread colors to match each ribbon. I also didn't feel like fooling with that. This is a skirt that needs to be twirled in. No project comes to me without some inspiration. 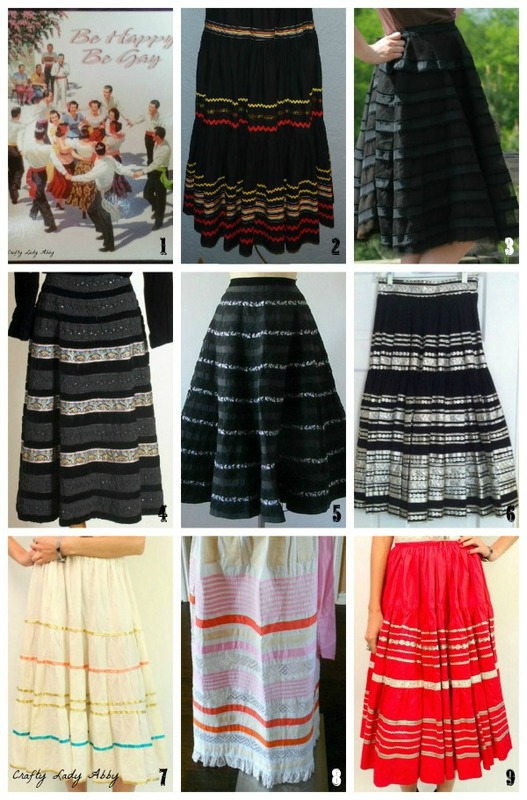 My big inspiration are vintage skirts that have similar encircling stripes of ribbon. The skirts are vintage ones on Etsy. 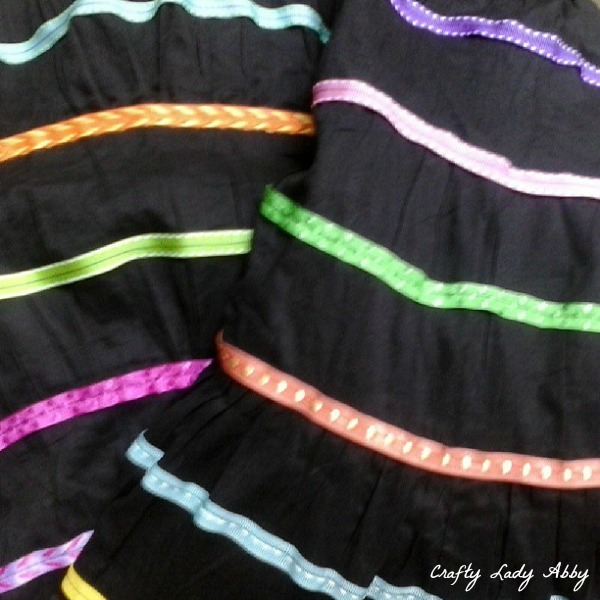 These should get your brain churning to how you can use ribbon to transform a basic peasant skirt into something fabulous. 1) I bought this post card a few years ago. I found it the other day tucked into a Dia de los Muertos postcard booklet I probably bought the same day. I thought it was fitting for this project. 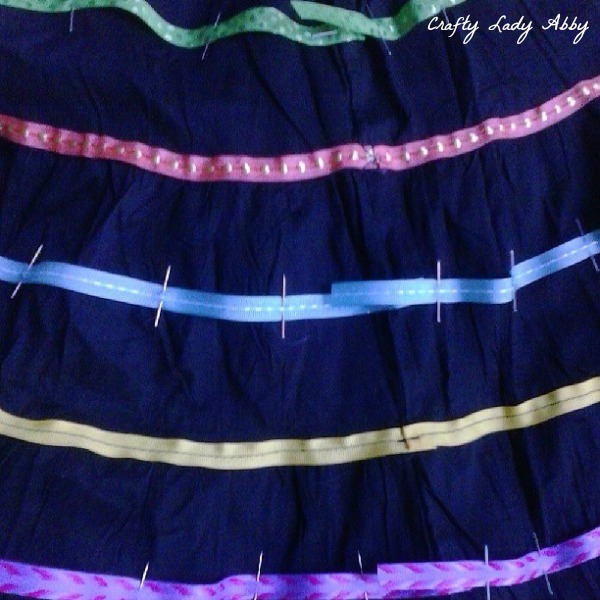 This is a photo of the skirt before I started, and my assortment of ribbon I was narrowing down. I bought a few more colors that I was missing a 2nd color of...yellow, blue, and purple. A fabric measuring tape - In case you feel like measuring the circumfrence at each point of the skirt where you will be sewing ribbon. You want to add a few inches to each measurement, for give in the ribbon. 1) Organize your ribbon into the order you want your colors to be. I alternated warm and cool colors. My order is purple, pink, green, orange, blue, yellow...repeat. 2) My skirt has a loose lining, so I pulled the lining up through the waistband, so I was only sewing through the top layer of the skirt. When I was done, I pushed it back through to lay correctly inside the skirt. I decided to break up the ribbon pinning and sewing into two parts. Handling all the ribbons pinned at once, while sewing, is painful if the pins poke me. 3) My skirt had raw edges where each tier is. For the 1st go at pinning and sewing the ribbon down, I used the warm ribbon colors...pink, orange, and yellow. For each tier seam, I folded under the raw edge, and pinned the ribbon along that seam. I smoothed the ribbon down as I pinned it to the fabric and used many pins. For stability, I placed the pins perpendicular to the ribbon. Where the ribbon ends met, I left a few inches, so I could fold it over for a nice finish. I started placing my ribbons along a side seam, so all of them ended there. I did the same for the bottom ones, though I needed to start another spool for a few of them, but same method for them meeting, fold one end on top of the other. 4) After I had pinned all the warm ribbon colors across their tiered seams, I used a straight stitch to sew the ribbon to the skirt. I started where the ribbon started, went around the ribbon and skirt, folded the other end of the ribbon over the starting one, and stitched it down. I set the stitch length to one good for top stitching. Ribbon can be delicate, and since this is an embellishment and not for structure, the stitch length doesn't need to be tight, just enough to keep the ribbon secure. I sewed down the middle of each ribbon, making sure to contain the raw edges of the skirt tiers. I pulled out the pins as I went along the ribbon, so I didn't stitch over them and risk breaking my needle. 5) After I was done sewing those ribbons on, I pinned on the cool colored ribbon (green, blue, and purple) in between the warm colors. Since I didn't have seams to guide me, I had to visually estimate it's placement. Since the skirt is essentially a flared circle skirt, the ribbon is going along a steady curve. You do have to be careful to follow that curve and still keep the ribbon flat. You can see what the warm colored ribbons look like sewn, how I placed the cool colors, how I pinned all the ribbon, and what the end overlaps look like before and after sewing. 6) I sewed down the cool colors of ribbon the same way I did the warm colors. After that, you are done! It's a lot of sewing, and you likely will have to reload your bobbin thread a few times. This is the finished skirt folded over on itself, just for photo sake. This is what the finished skirt looks like when I'm not twirling in it. If this skirt doesn't thrill you, think about other ways you could use this ribbon concept. Here are a few I think would look nice. Hope this gets your mind going. 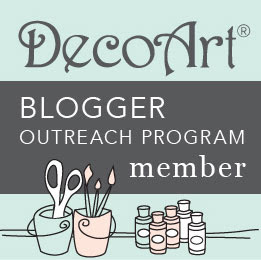 If you make anything using my tutorial, feel free to email me photos, and I'll share them here, craftyladyabby@gmail.com. Happy makery! I'm glad my version reminds you of the real Mexican clothes. For your blouse, I like the idea of colorful embroidery to go with the lace. If you want ribbon, treat it like a boarder, only using thin ribbon around the shoulder flounce by the edge/lace. I have a vintage Mexican dress in black that has lace & embroidery down it. It's gorgeous. I also have several vintage tops. The skirts were hard to come by at an affordable price in my size, so I made my own.